This review first appeared on Fourth & Sycamore. Pastoral poetry, for most of its history, has sought out scenes of agrarian life for the purpose of escape and reflection. It has turned to nature as solace from the cruelties and anxieties of human society. Nature has always seemed bigger than humanity, and as such, indestructible, just as a parent seems to a child wailing with fists against those impossibly tall legs. To be close to the earth is to touch purity, to drink clarity, and so pastoral poems are like cups of clear water. Or so we would like to believe. We were wrong about the earth. We can and have damaged it severely, and perhaps irreparably. Pockets of untouched wildness are growing smaller, and even these, beneath the surface, are tainted by our consumption, our naivety. A pastoral poet could choose to continue to write about nature as she remembers it, write about those who interact with nature for a living in old, sepia-toned vignettes, and use the form as an ongoing source of solace, however false. 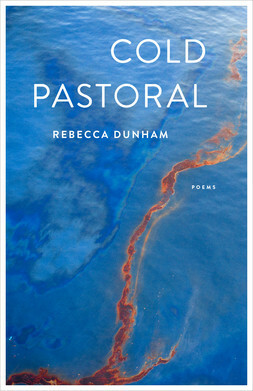 In Cold Pastoral, Rebecca Dunham refuses herself and us that comfort. If we’ve demolished and stained nature with our greed, then we don’t get to beg it to comfort us like an abuser crying on his victim’s lap in the aftermath. She writes about nature as we’ve shaped it: oil-stained beaches, melting ice caps, sea birds drowning in petroleum. She writes about the individuals who depend on the land in the same way: oyster fishermen out of business after decades, oil rig workers burned and blown apart during a disaster. and wait for sleep to find me. to learn how not to look. Cold Pastoral takes as its primary muse the 2010 Deepwater Horizon oil disaster in the Gulf of Mexico, an environmental event as visually provocative as it was ecologically devastating. Dunham uses this largest accidental oil spill in U.S. history as a totem for the pervasive damage human industry has done throughout the world. In keeping with her pastoral form however, she doesn’t sermonize. She just turns her poet’s lens toward nature, or where nature would have been, and writes what she sees. Like any pastoral poet, she shows us the world, the wildlife, the men and women who are close to it. to be drilled here, he said. In poems about the blowout (the explosive event that precipitated the disaster) and its aftermath, she writes with tremendous empathy about the workers who died in the blaze and who survived, forever altered by the trauma. She has no judgment for these men whose work did such damage to the earth; they were working men feeding families. Dunham shows us also the lives that were impacted along the Gulf Coast in the oily wake of the disaster. Oyster beds died out, beaches were blackened with tar, and livelihoods dependent upon seafood and tourism were lost. In “Field Note, 2011,” she meets with an oysterman who has nothing to do now that the oysters have died off. to show them all my dead oysters. I know. It’s not in our nature. We don’t want to look. We want to go on believing there are no consequences to our utterly unnatural ability to flood our rooms with light at the flick of a switch at any hour of the night, to eat mangoes from the supermarket in February in North America, to drive to another town on a whim and watch a movie on an 80 foot screen, to gift our children endless plastic likenesses of the machines that make these things possible. In Cold Pastoral, Dunham refuses us that blindness. The environmental loan we took out in exchange for unparalleled comfort and convenience may have had a long term and a low interest rate, but it’s coming due. Do we have any hope of paying it down? If there are to be any survivors, we have to pay attention. We have to be willing to look, and to remember. Rebecca Dunham is showing us how to do that.